Today I’m going to introduce a hidden hot spot in Seoul. 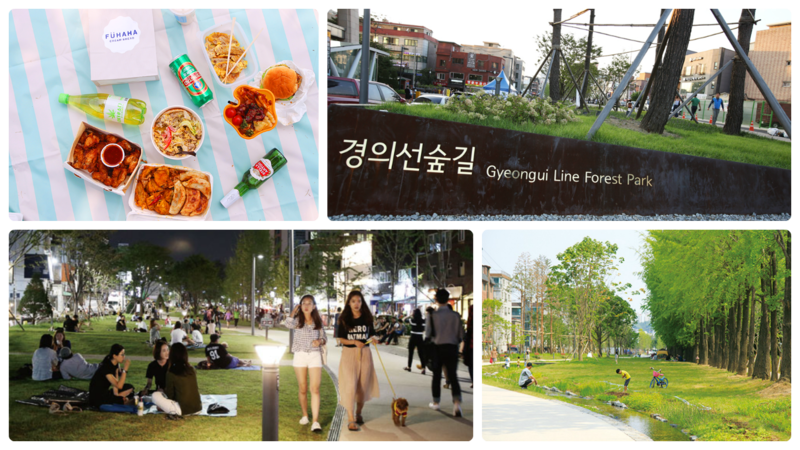 Gyeongui Line Forest Park (Yeontral Park) is just next to subway Hongdae station. After 7 pm in the night, the Park is full of people. Some are busking, walking a dog, strolling around, dipping feet in the pond or etc. You also can enjoy Seoulite night life. Then why does the park called Yeontral? It is combination of two places, Yeonhui-dong and central park. Just like central park in New York, this park lies on the center of the city with square shape. Real name of this park is Gyeongui Line Forest Park. It was a railway before, after the railway moved into underground the place were just bare and devastated field. Under construction, the field changed into beautiful hub of Hongdae. 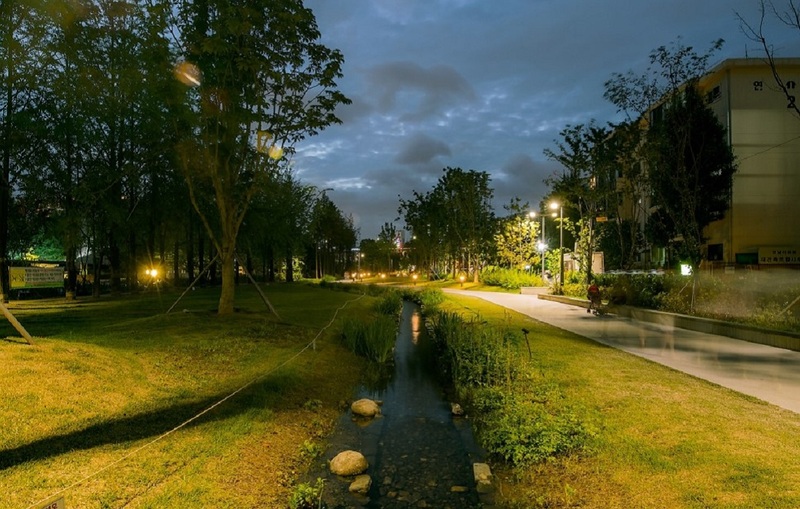 Inside of the park, there are many benches, green grass field, small artificial pond. As the weather gets hot, people sit next to pond and dipping their feet or kids are playing as though they are playing in water park. Especially on clear days, people bring own picnic mat and gather around. They drink beer and enjoy the food at Yeontral Park. Small food truck, beer supermarket, fresh juice shops are lining up along the park. Many people enjoy Gilmac in the park. Just like chimac( chicken + beer), Gilmac( street + beer) is combination of two words. Gilmac indicates drinking beer in the street or park. These days it became hot trend. Along with this trend, cup steak is quite popular. Before, steak was thought to be expensive restaurant food., but we can enjoy steak and beverage for just 7900~8900 won. Right top part of the picture is cupsteak, ‘ W Hand steak’ and ‘Haek steak’ are two major stores. The package simple but practical, only using one side of hand you can enjoy two things at ones! 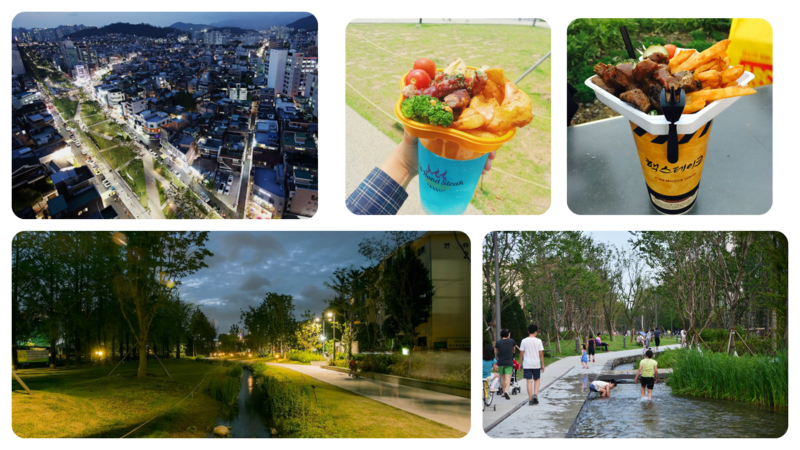 How to get Hongdae Gyeongui Line Forest Park? Walk from Hongdae Station, Line 2, Exit 3. Visit Hongdae at night !